It’s cold outside, but it’s colder in Asahi Foods’ refrigerated cutting room, where stacks of cardboard and Styrofoam boxes filled with giant fish await. The fish cutter is in early on a Saturday, wearing a white lab coat and heavy rubber gloves, various razor-sharp knives at the ready. Charlene Thai, a tiny woman in a similar lab coat, hovers nearby, watching over the daily cutting ritual that begins the flow of fresh-cut fish for sushi and sashimi to 200 restaurants in Colorado and surrounding states. 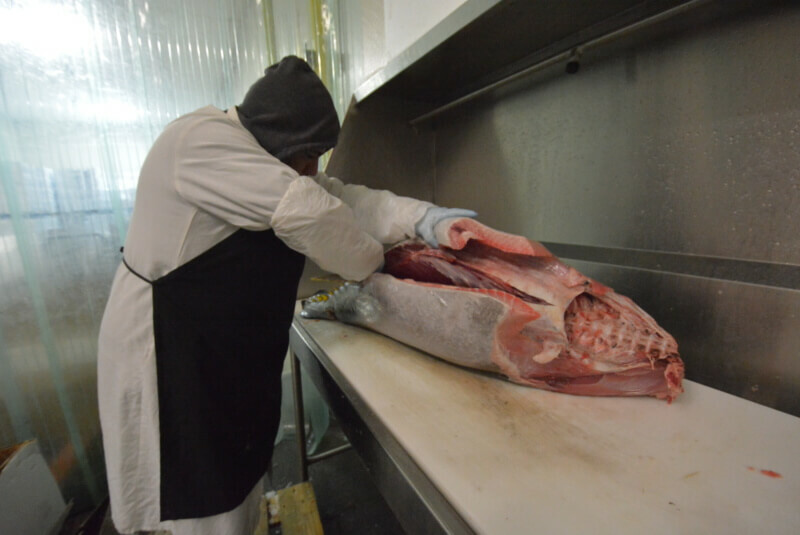 Thai is Asahi Foods’ general manager, and oversees two dozen employees, including the fish cutter as he tosses a headless 70-pound tuna onto an enormous cutting board and first trims off the collar and tail. He guts it from underneath, then hacks along spinal column to slice the fish all the way through. 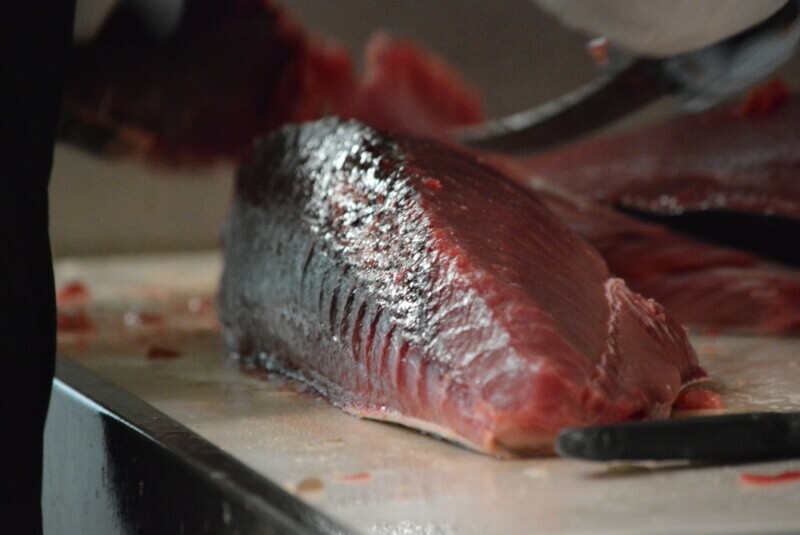 Then he deftly cuts the tuna neatly into filets about equal size, about 15 pounds each. They get gingerly arranged on trays and will be wrapped, labeled and delivered to sushi chefs up and down the Front Range. Hapa Sushi owner Mark Van Grack was Thai’s first customer when Asahi Foods launched five years ago, although he didn’t realize it. Van Grack credits Thai’s commitment to customer service for Hapa’s bond with Asahi Foods. That’s why it’s important to Thai to make sure the fish is cut cleanly — just right for her customers. Sushi is a big business today, and you can find it — good or bad — at hundreds of restaurants including Japanese, Chinese, Korean and any other fusion of Asian cuisines. You can even find it at supermarkets and the Walgreens on the 16th Street Mall, but not as a convenience store staple, like you can in Japan. There are 11,000 restaurants in the state, according to the Colorado Restaurant Association, but the organization doesn’t track them by cuisine. A search on Yelp for “Denver sushi” comes up with 433 results. There are several major seafood distributors in the area who provide fish to all these restaurants, including Seattle Fish Company and Blue Ocean, but they don’t focus specifically on supplying restaurants that serve sushi. Asahi Foods delivers mostly to metro Denver customers, but also to some customers along the Front Range and into the mountains. The company also makes long-distance deliveries to clients in Nebraska, Wyoming and Kansas, and even goes to South Dakota by piggy-backing on its parent company’s Chinese-food deliveries. 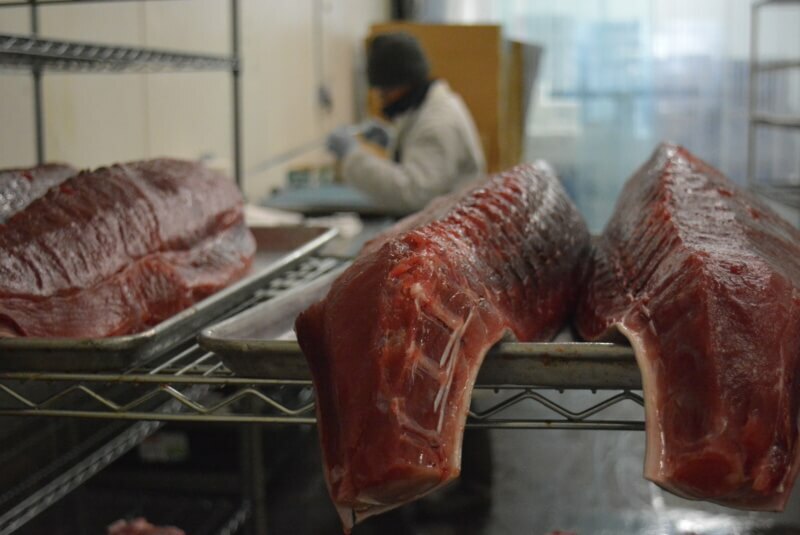 Asahi gets its wild-caught tuna shipped in from Hawaii, Fiji and Tahiti. The biggest tuna that ever made it onto Asahi’s cutting board was 500 pounds, Thai says. The company gets its salmon, which is farm-raised, from Scotland. Thai swears the salmon she gets has better flavor than Atlantic farmed or wild-caught fish. Thai says during the peak summer season, she flies in up to 8,000 pounds of salmon packed in ice weekly — 161 cases of 45 to 50 pounds each. Asahi cuts and delivers 40 to 50 whole tuna each week, depending on their size. Asahi Foods also distributes other types of fish, some of which are shipped frozen, and stocks other Japanese food from rice and condiments to sake. 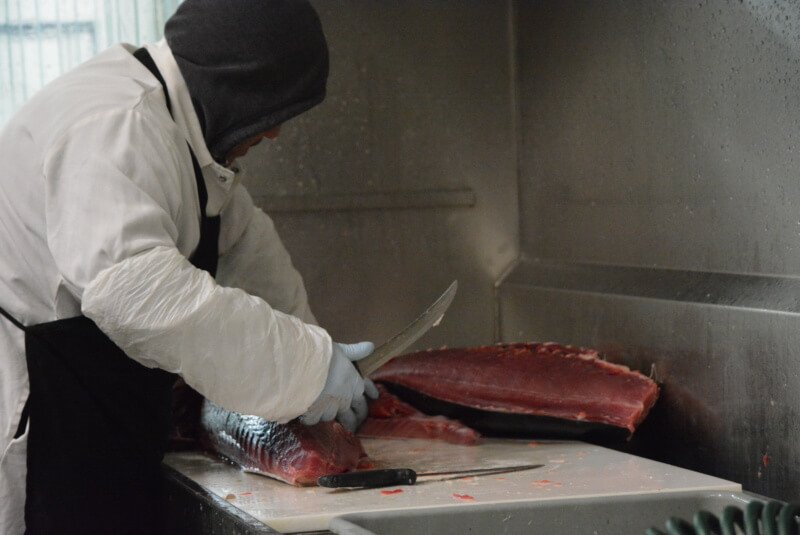 Some of the company’s clients have trained sushi chefs who can take whole fish and prepare it for sashimi and sushi, but most order the fish filleted. A tiny woman who exudes the energy and enthusiasm of an entire Little League baseball team, Charlene Thai is Denver’s queen of sashimi, the raw fish that is the main ingredient of sushi. 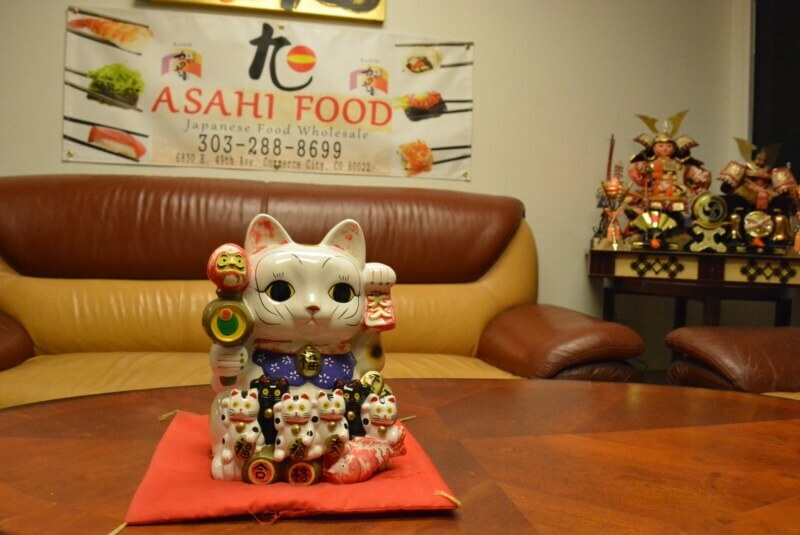 She supplies some of the area’s most popular Japanese restaurants, including Hapa and Tokio. And, she’s not even Japanese. No, she’s not Thai either. Charlene Thai is Chinese, and was born and raised in Taiwan. And her journey to being one of Denver’s premier fishmongers took a long and winding road. She went to Japan because at the time, there weren’t a lot of universities she could attend in Taiwan. 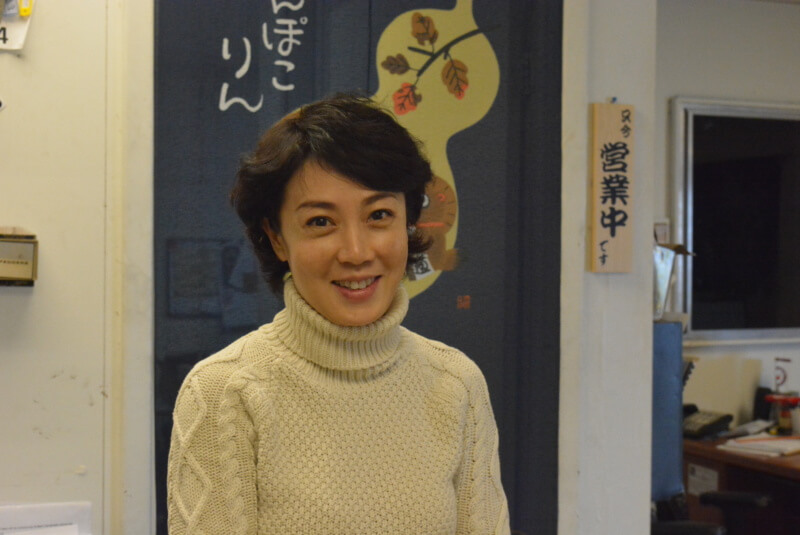 She attended a business school with a dream of being a tourist guide — for both Taiwanese tourists visiting Japan, and Japanese tourists visiting Taiwan. Then she had the idea of leading tours to America, but to do that she’d need to learn English. So in the 1980s, she came to Colorado, where she has family, and enrolled in the Spring Institute to learn English. She never went back to her tourism career. She got married and with her husband, ran a couple of Chinese restaurants which are now long gone. She also worked for a year for Kenny Sonoda, the owner of Sonoda’s sushi, at his original Lower Downtown location (now closed). That’s where she first learned the finer points of sushi. After that, she opened her own Japanese restaurant serving sushi in Highlands Ranch. When she sold that restaurant, she went to work for JFC International, a company that wholesales Japanese food products to restaurants. She decided to quit the food business and became a Realtor, she says, because she was raising a family and wanted the flexible schedule of real estate. But houses eventually led Thai back to food. One of her real estate clients owned a Chinese food distributing company, and he asked her to run a subsidiary that would supply fresh fish and other supplies exclusively to Japanese restaurants and other restaurants that serve sushi. She was the perfect hire because of her outgoing personality and her fluent Japanese. Five years ago, Thai launched Asahi Foods and has since become a familiar figure at Japanese community events. She’s a tireless leader within local nonprofits that serve the Japanese community, and donates regularly to events for community organizations. She recently donated dozens of salmon filets and pounds of salmon roe for an event commemorating the fifth anniversary of the Great East Japan Earthquake and Tsunami. The salmon and roe were used for a special dish from the Tohoku region. And not just connecting with the Japanese community, either. She’s active with the local Chinese and Taiwanese communities. She’s also a founder of the Asian Restaurant Association, which was just launched in March. Thai’s specialty is food safety, so she can help immigrant entrepreneurs navigate health-department rules, for example. The association will have experts on hand such as accountants and real estate agents to help new businesses, and plans to host new product demonstrations for Asian restaurants. She says community involvement has been a key to her success. “I hope other suppliers would do the same thing we do,” she says. “You know, you donate a small part of your profit to a nonprofit organization, that helps out your community. And if other people would think the similar way as I think, the return is phenomenal. The money you cannot evaluate. It’s this (touches her heart) feeling I feel here that’s important. “Look at what I got,” she says pointing to an omikoshi, or yatai, in an open space in her warehouse, between the administrative offices and the storage areas and cutting room. 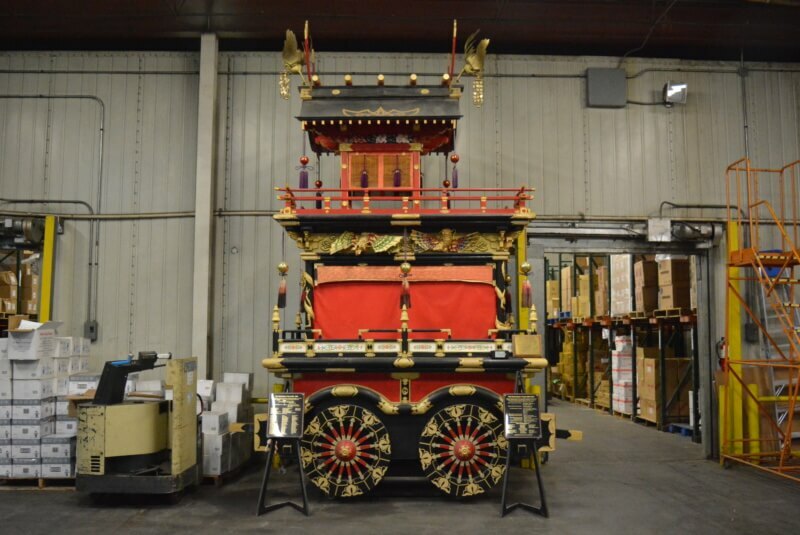 The yatai, a wheeled traditional palanquin or float, was donated to Denver by Takayama. It’s a replica of one from a fleet of floats used in Takayama’s famous spring and fall festival parades. It was on display at Sakura Square, but it needed to be moved for construction, so Thai offered Asahi Foods as a home for the artifact, at least temporarily until it can find a permanent public home. Thai’s enthusiasm for all things Japanese including the yatai are obvious to anyone who meets her. But she’s proud to be multicultural. NOTE: This article originally ran in The Denver Post on Sunday, April 17. Tagged asahi foods, charlene thai, fish, japanese restaurants, sashimi, seafood, sushi. Bookmark the permalink. DON’T BE BAKA — BUY THIS! 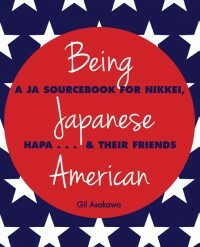 "Being Japanese American REVISED EDITION"
NOW AVAILABLE : THE REVISED EDITION OF "BEING JAPANESE AMERICAN" IS AVAILABLE IN PAPERBACK AND FOR KINDLE! It;s also available for the Barnes & Noble Nook reader and in the iBooks store for Apple's iOS devices! Read Nikkeiview columns going back to 1998, and read about Gil here. Why do people still hold hateful feelings for Japan from WWII? NIKKEI VIEW: The Asian American Blog | Powered by Mantra & WordPress.